In spite of the technological advancement on building design and construction, actual energy use levels of dwellings are different than expected in several cases. Little is known about how occupants interact with their dwellings, what the background to this interaction is, as well as the resulting energy use. This research aimed at revealing the relationship between occupant behavior and energy consumption, both in terms of heating energy and electricity. The determinants of occupant behavior, the sensitivity of dwelling energy consumption to occupant behavior, and defining behavioral patterns/profiles are the main elements of this work. This thesis will help to understand the occupant related factors of energy consumption in dwellings, by this way designing better products, energy management systems, software, and achieving better regulations. 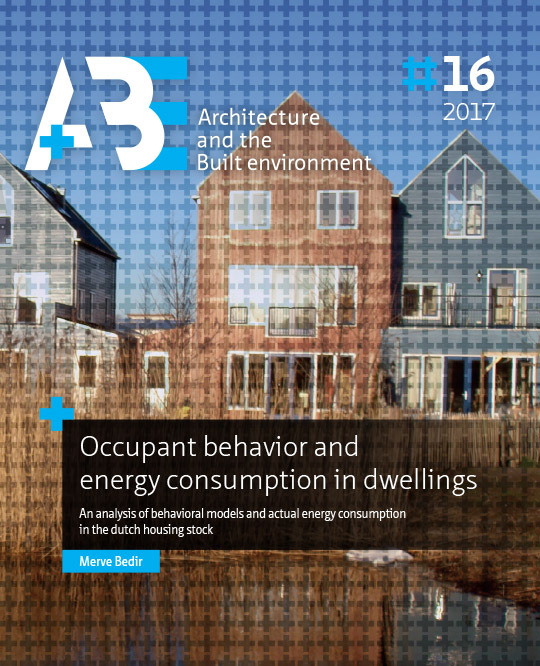 Research on energy consumption of dwellings covers thorough investigation of the behavioral performance during the occupancy process, as well as the aspects that are involved in the design and building processes. There has been extensive progress on the building physics aspects of energy consumption; concerning methods and practices for specification of building geometry, material properties, and external conditions. However, the resolution of input information regarding occupant behavior is still rather low. In order to respond to this, one of the research questions of this thesis has been: what is the sensitivity of dwelling energy consumption to occupant behavior? Secondly, the influence of lighting and appliance use on electricity consumption, as well as the determinants of electricity consumption in dwellings, and lastly, the behavioral patterns of energy consumption are investigated. This study’s methodological approach combined the deductive and the inductive methods, by considering both the determinants of behavior and the actual behavior itself. Deductive methods dissect energy consumption into its factors, such as household characteristics, dwelling characteristics, behavioral aspects, etc. On the other hand, inductive methods model actual behavior from bottom up experimenting and validating energy consumption levels. In this thesis, occupant behavior was considered as presence patterns in a space, together with the actual heating (thermostat setting and radiator control) and ventilation patterns (operation of windows, grids, and mechanical systems), and the use of lighting and appliances. This research looked at the building and household characteristics that determine occupant behavior, as well as habitual (surveyed) and actual (monitored) occupant behavior. BEDIR, Merve. Conclusion. A+BE | Architecture and the Built Environment, [S.l. ], n. 16, p. 221-240, dec. 2018. ISSN 2214-7233. Available at: <https://journals.open.tudelft.nl/index.php/abe/article/view/3603>. Date accessed: 26 apr. 2019. doi: https://doi.org/10.7480/abe.2017.16.3603.